The Gay Gamer: Will the third time be the charm for me and Namco's Taiko no Tatsujin 3DS titles? Will the third time be the charm for me and Namco's Taiko no Tatsujin 3DS titles? Full disclosure: I've owned a copy of the first Taiko no Tatsujin 3DS game--subtitle: Chibi Dragon to Fushigina Orb--for some time now and have yet to even open it. I bring that up because the bulk of the remainder of this post will focus on how I'm awfully intrigued by the just-announced third Taiko no Tatsujin 3DS title and I'll probably buy it even though I've completely ignored its predecessor so far. 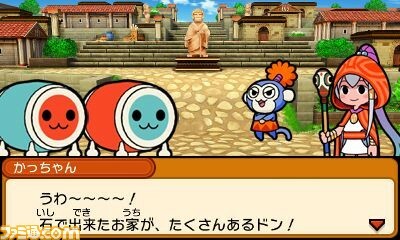 This third Taiko no Tatsujin 3DS release's subtitle is Dokodon! Mystery Adventure, by the way. 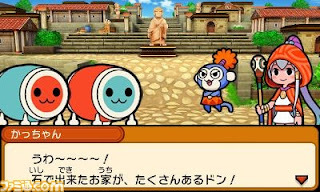 Here's what else is known about this handheld rhythm game at the moment: it's set to hit the streets--and 3DS eShop--of Japan on June 16, its cart will include over 70 songs and it'll offer players an RPG mode (like pretty much every other portable Taiko title). Oh, wait, I nearly forgot: Dokodon! Mystery Adventure also will feature tunes from Ace Attorney, Kirby's Return to Dream Land and Monster Hunter X. 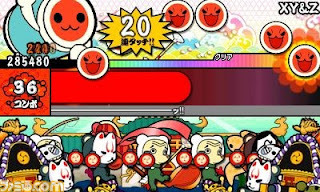 Now all I need for the folks at Bandai Namco to do is reveal the game's box art--which you just know is going to be brilliant (or at least brilliantly cute and colorful, much like that of Taiko no Tatsujin DS). Oh, who am I kidding? Even if its cover illustration is a complete turd I'll very likely pick up a copy as soon as AmiAmi or Amazon Japan starts allowing pre-orders. I don't suppose any of you are in the same Don-chan-loving boat?